Welcome to MFT's September Release MFT and Friends! This is our time to share more inspiration using products from this months release. For me, this is the prefect time for me to use some of my favorites from the new release again. I used a few of my top favorites from the September release on my card today-Bundle of Balloons die-namics, Birthday Boy & Girl die-namics, Happy Birthday Script die-namics and Black and White Dots paper pack. Oh, and the Mermaid Glitter and Sunset Glitter card stock too. Sorry (not really sorry) for another birthday card! But doing them makes me happy-using all my favorite things makes me even happier. Making a fun & colorful birthday girl card on another rainy day is good for the soul! If you haven't stopped by the MFT's Blog make sure that it is your next stop! 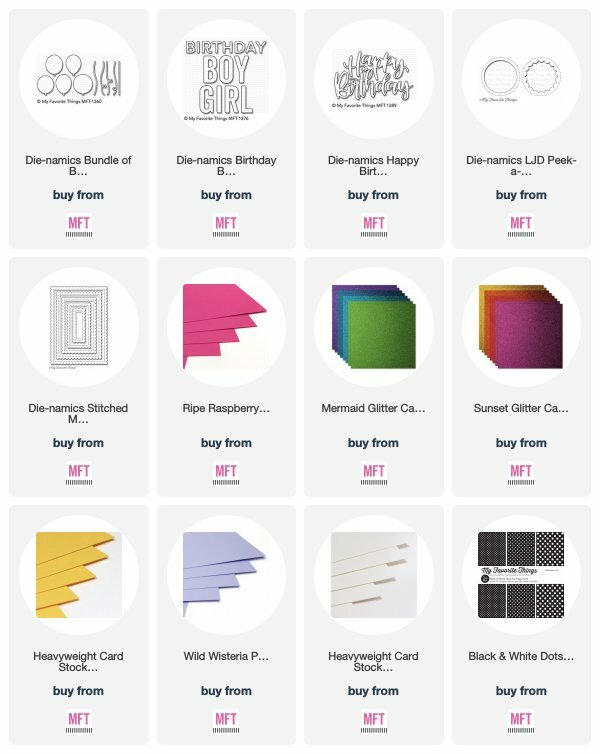 There are links to more DT blogs AND guest designers sharing more inspiration for you to take in using the new September release products. Enjoy, have a good day!